To get the best looking vinyl fence for your Franklin home, you need the best vinyl fence contractor around; one that has the experience, know-how and selection to ensure you get the best possible fence for your property. Welcome to Franklin TN Fence. We have years of experience, and our talented fence craftsmen are the best around. Vinyl fencing…one of the most popular choices of homeowners in Franklin. Vinyl fencing is loved by homeowners because of the beauty and ease of maintenance! Vinyl fencing comes in a wide variety of colors and styles, and we can match to any landscaping needs. Long-lasting, you will enjoy your vinyl fence for many years to come! Add curb appeal, mark property lines and increase your property value all with vinyl fencing. Franklin TN Fence has been installing vinyl fencing for many years. Our fence contractors are some of the best in the industry, and will help you to choose the best look for your property. You can trust the talented Franklin fence professionals to install your vinyl fence to make your property as beautiful as possible. 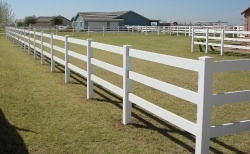 Our goal is complete customer satisfaction with each and every vinyl fence install that we do. Our team will design and install the perfect privacy fence just for you! Click here to view our Vinyl Fence gallery.